Mercruiser trim pumps. Power tilt and power trim. Eaton trim motor. 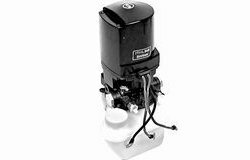 Mercruiser has updated trim pump designs over the years. It is important to match your pump with your cylinder style. Older pumps (Prestolite) that have the square reservoirs and cylindrical motors are no longer sold. These older units were High Pressure-Low Volume pumps. 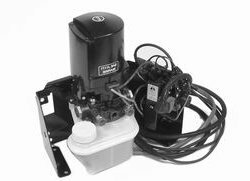 Mercruiser now has replacement High Pressure-Low Volume pumps (see below). This "adaptor" pump looks just like the new style Oildyne pump. They used the smaller diameter hydraulic trim cylinders. Newer style pumps (Oildyne) are Low Pressure-High Volume pumps. These newer units will have a plastic motor housing and a white plastic reservoir. They should be matched to the newer larger diameter hydraulic trim cylinders. Used on older pre-Alpha and "R" style applications. Matched to the smaller older style trim cylinders. 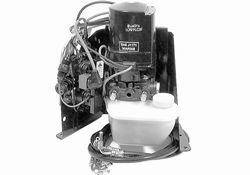 Eliminates the need for a mechanical reverse lock valve. Used on Alpha One, Alpha Gen II and Bravo Drive applications. Matched to the larger new style trim cylinders. 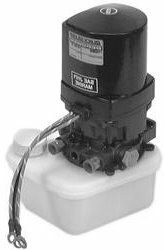 Includes Motor, Pump and reservoir only. Important! The plastic reservoirs have changed. Is your white plastic reservoir cracked near the mounting screw hole? develop spider cracks around the screw hole. The old defective reservoir was part number 18525A1 which is no longer sold. 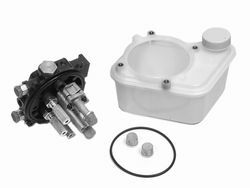 a Top-Mount style reservoir-pump kit 883169A1. This is mentioned in Mercruiser Parts Bulletin 01-04. 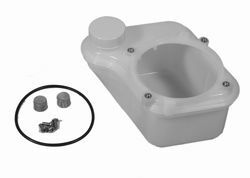 Includes pump and top-mount style reservoir tank, screws and o-ring. Fits new style 4-screw type pump housings only. This tank will NOT fit the old style single-screw pumps. What type of oil? These units all use standard 10-40WT Motor Oil.